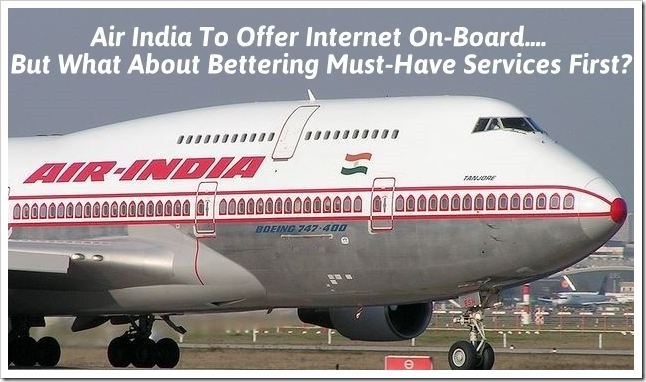 Air India wants to become first Indian aviation company to offer Internet access on their aircrafts. According to ToI, state owned Air India is talking to vendors for deployment of internet services on their Aircrafts which fly domestic as well as international routes. Air India has setup a panel to examine the technical aspects and ensure that onboard Wi-Fi connectivity. As per reports, they are currently in talks with French company Thales, world’s leading in-flight entertainment and connectivity company. While there is no Indian aviation company currently offering in-flight Internet services, leading international airlines like Singapore Airlines and Emirates have been offering it for quite some time. How About Improving MUST-HAVE Services first? Prima-Facie the news of in-flight internet being offered by Air India is a great news, there are number of issues that Air India needs to look at some of the “must haves” rather than going behind something that is “good-to-have”. First and foremost, Air India needs to improve on their timeliness – They have lowest “on time performance” compared to all the other aviation companies. If the aircraft does not take-off or land on time, everything else does not matter. Secondly, Air India is launching internet services so that could make some money out it, a much required aspect for this ailing company. If their customers have to pay for these services, very few people will opt for it, unless it is very competitively priced. Air India needs to understand that people choose Air Crafts for their timeliness and for free services they offer on-board. If internet services were free, probably it might have made some difference, but that is not the case. And most importantly, international airlines who have offered these services, have not been very successful in making money out of it. If that is the case, it is bound to be a sure-shot failure in India given that India has a very miniscule penetration of internet users. In our view, Air India should drop this idea and concentrate on important things like bettering their service and on time performance.